As the summit of the church's liturgical year, the Paschal Triduum requires the energy, time, and talents of many people within the parish community. In Three Great Days, Jeremy Helmes draws on rubrics, liturgical theology, the church's tradition, and plenty of lived experience to offer a sound guide to planning and preparing. He draws attention to rituals requiring special attention and helps you determine liturgical roles and responsibilities. He also offers templates, worksheets, planning forms, and other ready-to-use resources that any parish can use to make their liturgical preparation and evaluation easier and more effective. Whether it's your first time preparing these liturgies, you're looking for fresh ideas, or you just want to make sure you're covering everything, this book will help your parish make this year's Triduum three truly great days. Jeremy Helmes is the pastoral associate for worship at St. Maximilian Kolbe Parish in Cincinnati. He serves on the board of directors for the National Association of Pastoral Musicians and his articles have been published in Pastoral Music and Worship. 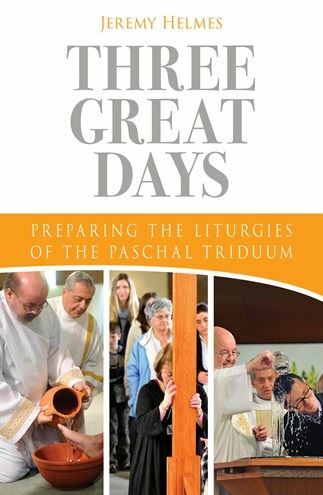 If you are looking for an informative, practical, organized book to assist pastors, deacons, musicians, worship commissions, and art and environment committees prepare for the Sacred Triduum liturgies, Three Great Days is a must have resource. Jeremy Helmes, a musician, liturgist, and seasoned parish minister, systematically walks through the celebration of the Paschal Triduum: its history, the liturgies, personnel needs, checklists, tips for liturgical ministers, a timeline, and much more. Jeremy's academic study and years of parish experience has enabled him to provide informed, practical recommendations and ideas, as well as useful tips which will assist any liturgy committee as they prepare for the Triduum. To ensure a well-prepared and well-celebrated Triduum, Three Great Days will surely help you in this endeavor! If you have a key role in planning and celebrating the Sacred Paschal Triduum each year, blessed are you. But frustrated are you because you do not get to watch how other parishes do it. Reading Jeremy Helmes's book is like having a bright conversation with an experienced guide. Three Great Days offers step-by-step practical advice, brimming with ideas, grounded in history and tradition, yet fostering creative thinking. This book will help you celebrate a better Holy Week this year. This is an important book for anyone involved in the planning and execution of the Paschal Triduum. It is highly accessible, easy to read, and filled with many helpful details that are both pastoral in their perspective and liturgical in their grounding. Helmes knows the tradition, the theology, and the practice. Coupled with his wealth of experience, this book has the potential to educate and inspire both liturgical ministers and the entire assembly. Highly recommended! Three Great Days is an essential tool for both the seasoned and the new liturgical planner. This title is practical and walks the entire planning team through each of the Paschal Triduum celebrations. Each chapter is practical, founded on tradition, and profoundly pastoral. It is recommended for all parish libraries. If a pastor and Christian community want to worship "well" during these three days, then I highly recommend purchasing this book. It will help them begin an ancient journey that is also a contemporary one, because the presence of Christ is in our midst. A congregation will grow in their faith and understanding of Baptism and the new life in Christ. By investing the time and energy in this, your parish will benefit throughout the whole year.